Jay and Veronica eloped to Paris early spring. 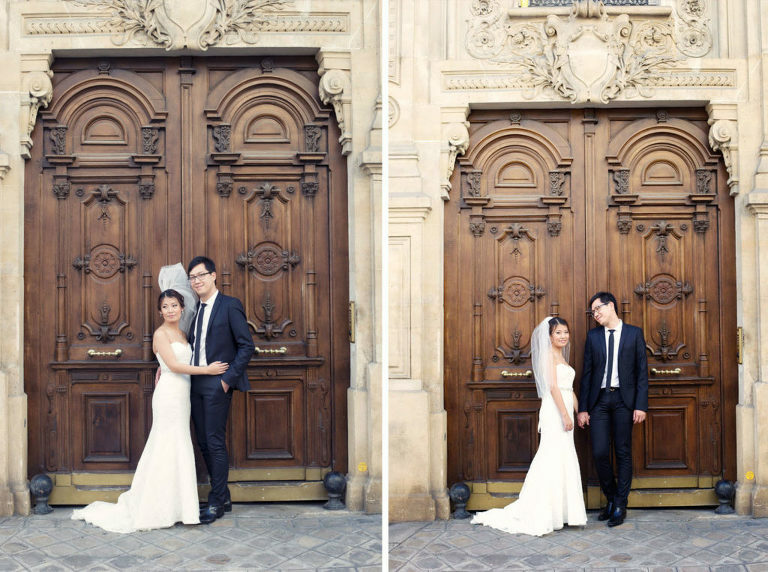 They travelled from San Francisco to get married in Paris. A big dream come true …. Neither of them had travelled to Europe before. They had just arrived in the city the previous day! We did not have the time to meet before hand to fine tune all of the little details. Actually all of the little details had been orchestrated with style by wedding planners from “WeddingLight Events“. On the day of their elopement, we travelled in a classic 2CV citroen from 1958! It was an adventure really and a great prop to use for a wedding photographer. The first stop took us to the gardens of the palais Galliera where our couple had their elopement ceremony. We were so much in luck, the weather was just splendid on the day while it had rained all week. The umbrellas stayed in the car after all. After the ceremony we had three hours of photography in Paris. The palais galliera being round the corner from the Eiffel tower, our first stop was the Trocadero area. We then followed the seine, stopping at the pont Alexandre III, the place de la concorde, then on to the ile saint Louis where we had a little stop over at Bertillon for an ice cream. I am quite happy with the photographs. They are shot in a lifestyle manner, it shows their happiness. The photos are quite lively and we had a lot of fun together. I try to keep my photography “simple”, natural without much artifacts. They were both a little shy. I hate to force poses to my clients. I want them to be relaxed and feel comfortable with the process. I rely on visual instincts and do not try to copy poses from wedding blogs. This way, i feel that my photography has integrity and doest fall into stereotypes. Voila! as we say …. I hope you all enjoy looking through those few photographs. 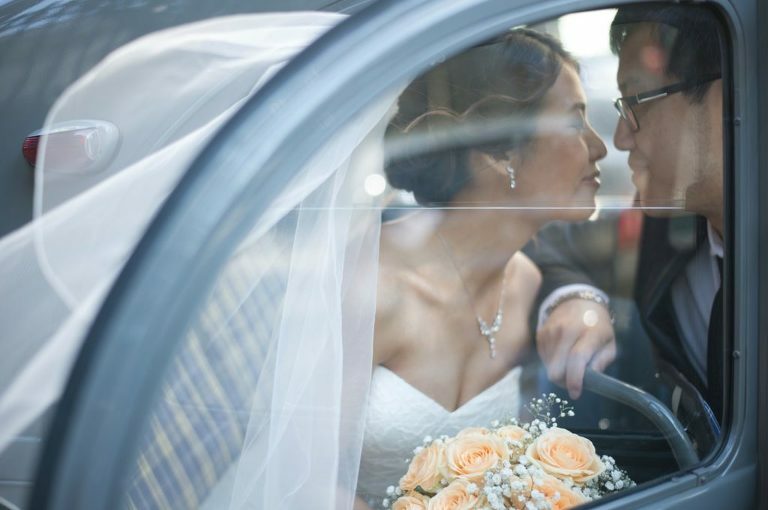 Traveling the city with a couple should it be for an engagement photo session, wedding photography,an elopement or a private session is all about having some fun. 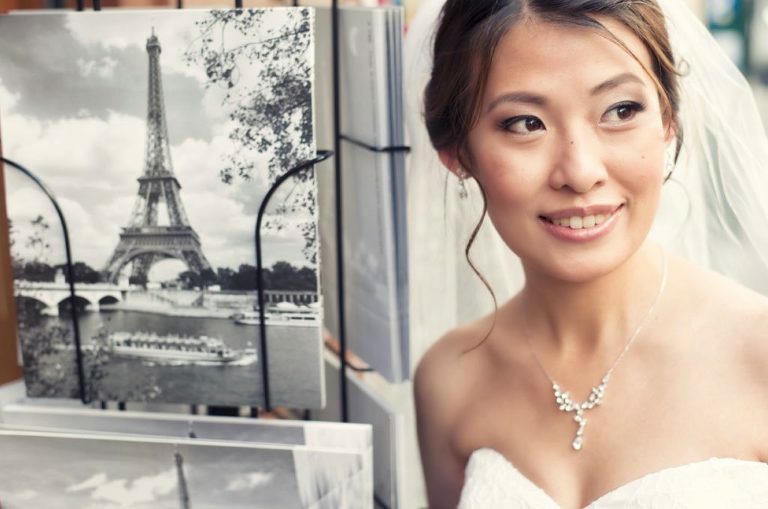 Paris is an amazing backdrop for creative & romantic photography. The Eiffel tower area is certainly the prime destination for couple photography. The louvre, the seine, the islands and renaissances parks are certainly places to go to as well on your photo tour. I advise my clients to allocate a little more time then originally plan if you are looking at a large selection of photographs with various landmarks and little quaint spots as well. It sometimes takes time to travel from A to Z. Here is one of my last Paris engagement photo session by the way. A total of three hours of having fun, with a little drizzle at time, a cool umbrella and a great couple from San Francisco.